Mendelson's Memos: Review: Beasts of the Southern Wild (2012) is an engrossing, intoxicating, and devastating modern-day fable. Review: Beasts of the Southern Wild (2012) is an engrossing, intoxicating, and devastating modern-day fable. Opening June 27th in select theaters. Beasts of the Southern Wild is among the most transporting films you're likely to see. Director and co-writer Benh Zeitlin, using Lucy Alibar's play Juicy and Delicious, crafts a fully enveloping world that is both pinpoint specific and all-encompassing enough to be a timeless fable. On the surface, it is a character study of one six-year old girl as she comes to terms with the possibility of becoming an orphan as a natural disaster devastates her dirt-poor backwoods community. Yes, it's about people surviving Hurricane Katrina and yes it contains certain social/political commentary, but it is a universal saga of grief and survival. The film's greatest narrative strength is that it refuses to be a representative saga of the impoverished victims of that 2005 storm. 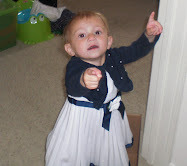 It is merely a heart-wrenching would-be myth told from the point of view of a single child. 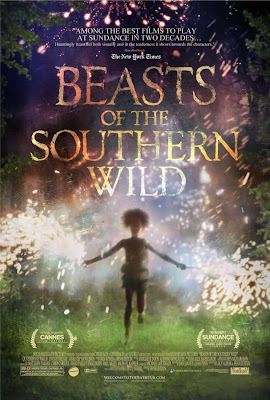 Doing even a brief plot synopsis would do the film a disservice, so I'll merely state that the film involves the relationship between young Hushpuppy (an Oscar-worthy Quvenzhané Wallis) and her tough-love father Wink (Dwight Henry). Theirs is a world of seemingly unimaginable poverty, the kind that certain political factions like to pretend doesn't exist in America. But the picture neither editorializes their circumstances nor does it try to ennoble their seemingly cut-off community. Some viewers may be put off by the squalor on display while others may merely find themselves grateful for their own financial/social situation and/or self-congratulating in their acknowledgment of these sorts of living conditions. But the film merely presents the world of this backwoods Louisiana nicknamed 'the Bathtub' at face value with little commentary. This is not a documentary, but rather a film that tells a surreal fairy tale in a seemingly foreign world that is in-fact right within our own borders. There are moments of devastating emotional power and the picture is built on a foundation of the anticipation of unimaginable grief. Hushpuppy knows that her father is not long for this world, and while she occasionally talks about finding her (dead) mother, it's clear that she knows that she will soon be a parent-less child. The storm that basically destroys their home is merely another obstacle for a father and a daughter to overcome in a journey to stay together for as long as they can. Wink has the domineering behavior of a seemingly harsh and judgmental patriarch, but he knows his own mortality and is desperate to teach Hushpuppy how to survive when he is no longer around. Hushpuppy's sole solace is in the community around her, a tight-knit group of equally poverty-stricken people who stick together because they have no chance whatsoever alone. All these elements come together to form an uncommonly intimate and thoroughly authentic portrait of a community struggling to survive in a country that has basically cut them off from 'society'. The Beasts of the Southern Wild is easily one of the best films of 2012. Even though it concerns Hurricane Katrina, it is not intended to be 'the Katrina film'. It's not When the Levees Broke nor is it Treme, but rather a singular child's-eye view saga of uncommon power. It is visually unlike any film you're likely to see in the near-future, melding periodic fantasy elements with devastating tragedy and authentic humanity. It is the kind of intimate experience that ennobles independent film-making and it is a genuine piece of must-see cinema.